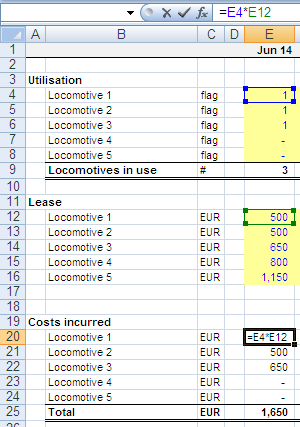 What we call an "asset utilisation plan" here is basically a table of flags indicating by 1 or 0 when an asset is or is not in use. As you might notice, this bases on the concept of 1/0 flags, as introduced in the article "Working with Flags". Taking this one step further, you can use the same structure to show the number of instances of one kind of asset. The concept is quite flexible and can be adjusted to specific needs. 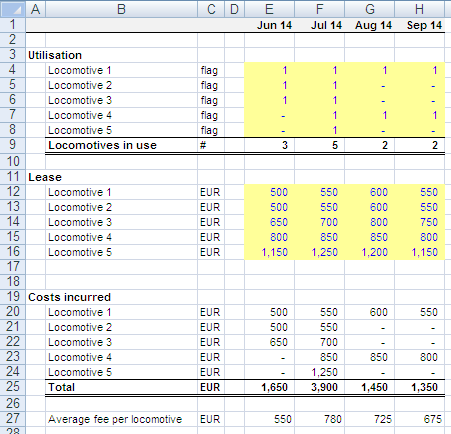 For example, you could organise the assets (in this case the locomotives) by type to project the financials at a more detailed level.